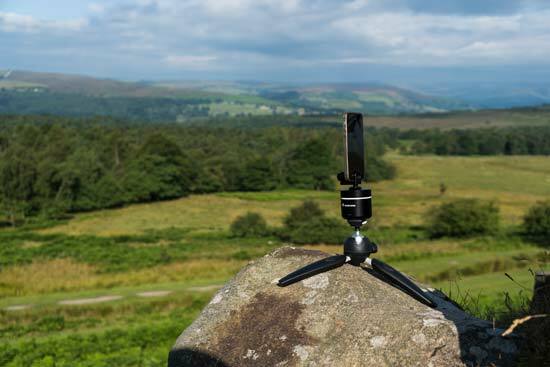 The Manfrotto Pixi Pano360 is a compact, motorised head that can be remotely controlled to create panoramas and moving timelapse videos with your camera. With up to a 2kg load capacity, the Pixi Pano360 supports smartphones and action cameras like the GoPro, in addition to compact system cameras and entry-level DSLRs. 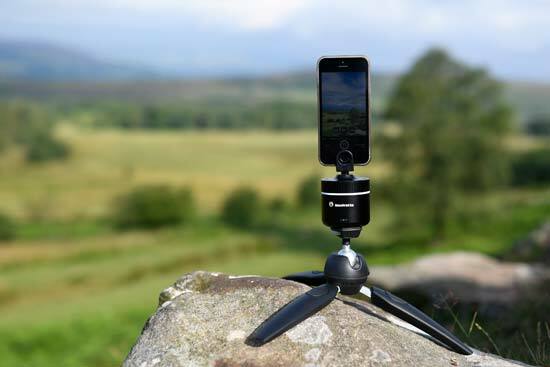 In addition to a remote control, a free Pixi Pano360 app for iOS and Android is used to wirelessly control the device, with four shooting modes that include photo, panorama, video and time-lapse. A little more information for customers about what the Pixi Pano360 is able to do is needed, because the specification of the product suggests that it is an aggressively priced competitor to the well established Syrp Genie Mini, which in reality it is not. We will explain exactly what we mean by this in the review. What you get in the Pixi Pano360 is a solid device constructed of premium metal. It takes up very little space in your bag and is even small enough to fit in your pocket. Our pictures of a smartphone mounted to the Pixi Pano360 give a sense of scale. Essentially it is roughly the same size as an action camera like a GoPro. Manfrotto’s own micro-tripods like the Pixi Mini and Pixi Evo are a perfect size-match for the Pixi Pano360. However, the stronger Pixi Evo is more able to support a loaded Pixi Pano360. 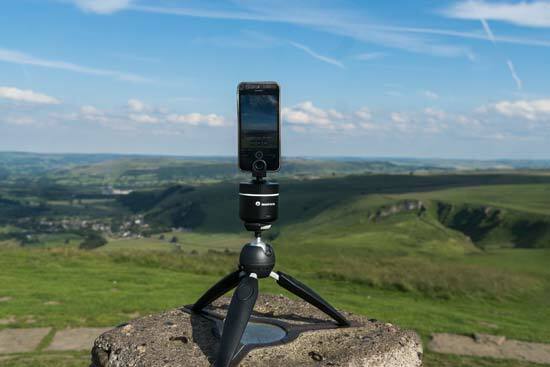 Of course, the Pixi Pano360 will attach to any tripod via its universal 1/4in thread on the bottom - for example a Gorillapod or any travel tripod. 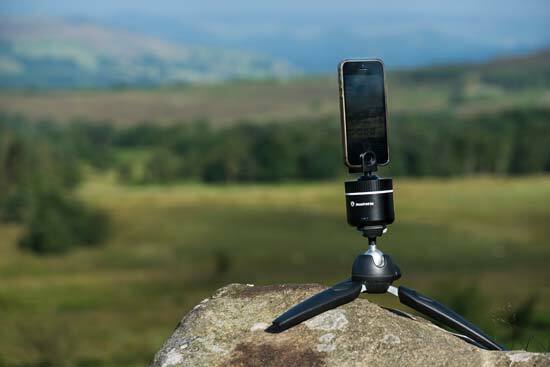 The Pixi Pano360 comes supplied with a universal smartphone adaptor and an action camera adaptor, both of which are attached to the top 1/4in thread. Cameras with a 1/4in thread (that’s virtually all cameras) attach directly to the Pixi Pano360 head. The device can be stored in the supplied carry case when it is not in use. The Pixi Pano360 is powered by a built-in lithium battery that can be charged through its standard micro USB port. We used the device regularly over the course of a day, including numerous time-lapse videos, and the fully charged battery still had some life left to it. Over extended time with the Pixi Pano360 in the kit bag, we came to expect its battery to last a whole weekend of moderate use. Playing back the first videos we recorded in controlled conditions and the motor provides a smooth and silent rotation. A silent rotation is brilliant for video capture where sound matters. When out and about in tricky conditions, the time-lapse and video recordings are of course affected by wind. In such cases, a sturdy tripod offers better support than the Pixi Evo. To avoid damaging the motor, Manfrotto advises users not to forcibly turn the Pixi Pano360 head. Actually, it's a little tricky to fully tighten the adaptor or camera to the motorised head without accidentally turning the head a little. In this regard, we felt the need to treat the Pixi Pano360 with caution. We found it necessary to semi-regularly check that an attached camera/ adaptor is still fully tightened - it can come a little loose. Some sort of grip around the thread would be handy. It didn’t take too long for the motor to feel affected by usage. A small section of the 360° rotation became juddery and the motor noisy, especially with a compact system camera attached rather than smartphone. Of course, the heavier a load, the more likely the rotation loses its smooth quality. The specification states that the Pixi Pano360 can take up to 2kg payload, but we wouldn't exceed more than half of that to ensure smooth captures. This is especially the case for front heavy setups, like interchangeable lens cameras. Treat the product with extreme care and you will probably avoid these issues. However, we would like to see an easier way to securely attach the adaptors or a camera without risking damage to the motor. Overall, we feel the device is best suited for smartphones, action cameras and compact cameras.